Ladies and Gentlemen, the public phase of our hearings is now over; but, as noted by Chairman Hamilton, our work is far from complete. It may interest you to know that we have concluded our hearings in 41 days of testimony, which includes one day of executive session, and this was in accordance with our original schedule. It may also interest you to know that in the Watergate hearings, they consumed 53 days of open hearings, 81 days of executive session, a total of 134 days as compared to our 41. While there have been differences of opinion expressed by members from time to time, I will always look back upon these hearings as a model of how members of both Houses of Congress can work together on sensitive foreign policy issues in a bipartisan spirit. Like Chairman Hamilton, I wish to applaud each member of both committees for his contribution to the success of this unique joint effort. My Vice Chairman and partner, Senator Rudman, and Chairman Hamilton and his Ranking Minority Member, Representative Cheney, deserve special recognition for their role in ensuring that these hearings would not deviate from their high purpose. I also wish to thank the committee staff: Arthur Liman, without him, I don’t know what history would have written about these hearings; Mark Belnick, Paul Barbadoro, Mary Jane Checchi, Lance Morgan. There are two others I would like to acknowledge. One is Joan Ansheles, and last but not least, Peter Simon. I promised that we would address the following questions: one, were the statutory restrictions on U.S. aid to the contras violated? Three, were the Executive Branch’s own internal checks and balances bypassed in policy decisions on Nicaragua and Iran? Four, was there a public foreign policy and, simultaneously, was there a very different, covert foreign policy? Five, was American foreign policy privatized? Six, were decisions on the most significant matters of national security driven or influenced by private profit motives? We have kept our promise in examining these questions. The story has now been told. Speaking for myself, I see it as a chilling story; a story of deceit and duplicity and the arrogant disregard of the rule of law. It is a story of withholding vital information from the American people, from the Congress, from the Secretary of State, from the Secretary of Defense, and, according to Admiral Poindexter’s testimony, from the President himself. It is also a story of a flawed policy kept alive by a secret White House junta despite repeated warnings and signs of failure; with concession piled upon concession, culminating even in a promise to help secure the release of the imprisoned Daiwa terrorists who bombed the U.S. embassy in Kuwait. It is a story of the National Security Council staff becoming a dominant organ of foreign policy and shutting out those who disagreed with its views. It is a story of how a great nation betrayed the principles which have made it great, and thereby became hostage to hostage-takers. And, sadly, once the unsound policies began to unravel, it became a story of a cover-up, of shredding and altering the historical record, and of fall guy plans suitable for a grade-B movie, not a great power. I believe we have largely succeeded in piecing together the incredible chapters of this chilling story and presenting to our fellow citizens a chronology of events as they occurred. However, we may never know, with precision and truth, why it ever happened. Did this unseemly chapter in our history result from the disregard of our laws and Constitution by well-intentioned, patriotic zealots who believed in the doctrine espoused by the Marxists that the “ends justify the means”? Or, are we here today because of the inadequacy of our laws and constitution? Should they be clarified, amended or repealed? Or, is this the result of an inadequacy in our national leadership? 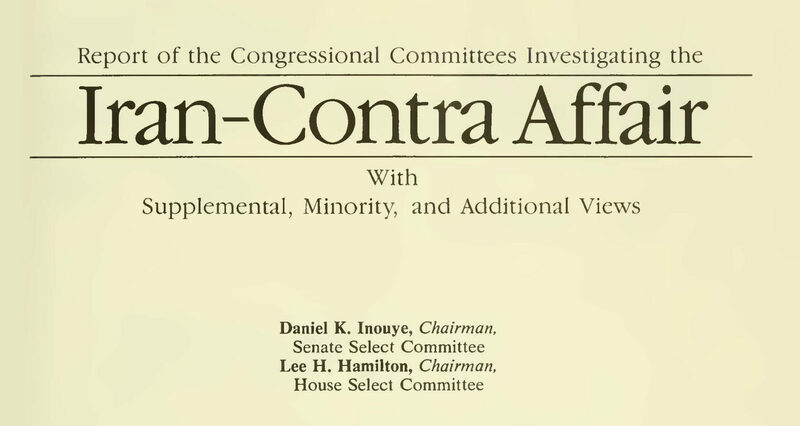 Obviously, these hearings have been about issues much more profound than who did what or knew what in the Iran-contra affair. They have presented two visions of government, much as the Constitutional Convention was presented with different views of the relationship between government and its citizens 2000 years ago. One vision was described in the testimony of Admiral Poindexter, Lieutenant Colonel North, General Secord, and Mr. Hakim: That of a secret government, directed principally by NSC staffers, accountable to not a single elected official, including apparently the President himself — a shadowy government with its own air force, its own navy, its own fund-raising mechanism, and the ability to pursue its own ideas of the national interest, free from all checks and balances and free from the law itself. Congress, and not the Cabinet. It is a vision of a government operated by persons convinced they have a monopoly on truth. Albert Hakim, a businessman who admitted he was in it for the money, could boast to us that he was more competent to manage the Iran initiative than the Secretary of State. Richard Secord could tell us he was more capable of running intelligence activities than the CIA. Oliver North could describe, with enthusiasm, Director Casey’s plan for a private, off-the-shelf organization that would conduct covert operations forbidden to the CIA with funds generated from the sale of U.S. arms. John Poindexter could say that this all sounded like a good idea, maintain that Congress had no meaningful role in foreign policy, and act secure in the belief that the President would have approved the diversion of funds. I believe these hearings will be remembered longest not for the facts they elicited, but for the extraordinary and extraordinarily frightening views of government they exposed. Fortunately, our hearings were able to present another vision of government: One that is accountable to the people; a legitimate, not secret, government, in which “trust is the coin of the realm,” as Secretary of State George Shultz said. This is the balanced government that our founding fathers contemplated in our Constitution. In describing their motives for riding roughshod over the constitutional restraints built into our form of government, Admiral Poindexter and Lieutenant Colonel North used almost the identical words: “This is a dangerous world,” they said. That, my fellow citizens, is an excuse for autocracy, not for policy. Because no times were more dangerous than when our country was born, when revolution was our midwife. Our system of government has withstood the tests and tensions of civil conflict, depression and two world wars, times hardly less challenging than our own present. Indeed, as our greatest military leaders, such as Washington, Marshall, and Eisenhower have recognized, our form of government is what gives us strength. It must be safeguarded, particularly when times are dangerous and the temptation of arrogate power is the greatest. Vigilance abroad does not require us to abandon our ideals or the rule of law at home. On the contrary, without our principles and without our ideals, we have little that is special or worthy to defend. My fellow Americans, out of this experience, may we all better understand and appreciate our Constitution, strive harder to preserve it, and make a fresh start at restoring the trust between the branches of government. For, in America, as 200 years ago, the people still rule. With that, these hearings stand recessed until further call.